Q: Tell us a bit about ORCAS and the background of the research. A: The O2/N2 Ratio and CO2 Airborne Southern Ocean Study (ORCAS) is a National Science Foundation (NSF) atmospheric research project that is based in Punta Arenas, Chile from 15 January - 28 February 2016, and is studying the role of the Southern Ocean in the exchange of oxygen (O2) and carbon dioxide (CO2). 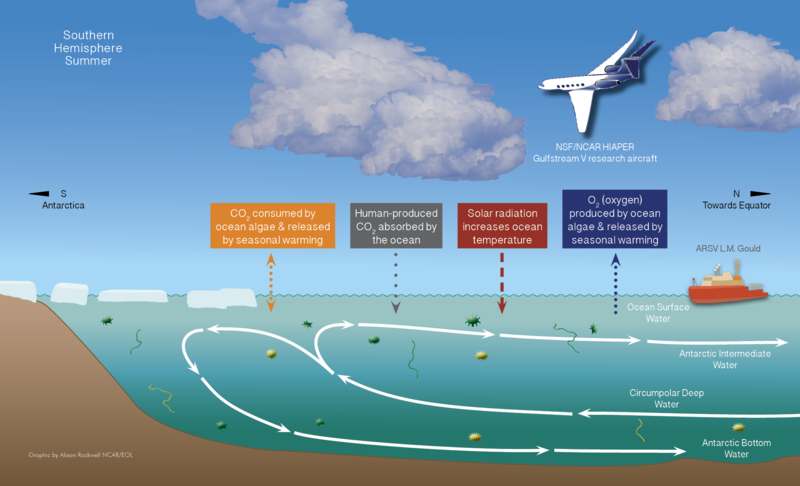 ORCAS will use the NSF/NCAR HIAPER Gulfstream V research aircraft with a suite of specially designed instruments on board to make measurements of gases in the atmosphere and other environmental conditions over the course of approximately 14 research flights. Climate models do not represent this portion of the globe very well in part due to limited measurements, so the data collected through this study will help advance our models so the future trajectory of the climate can be better understood. 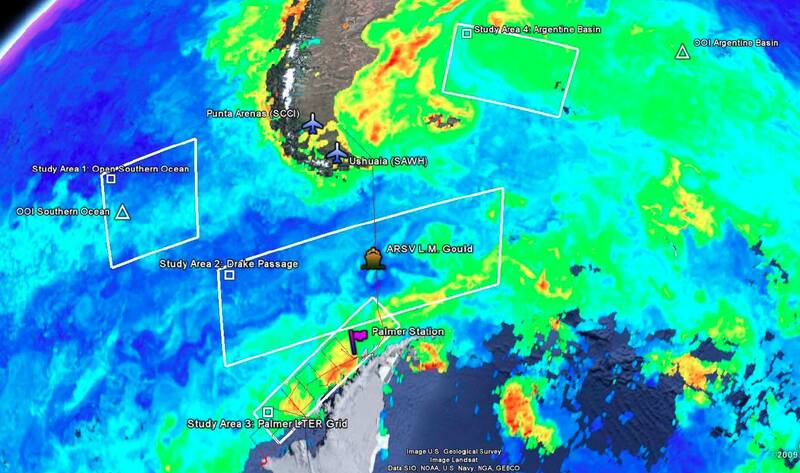 The project is led by scientists from the National Center for Atmospheric Research (NCAR), Scripps Institution of Oceanography, University of Colorado, University of Michigan, NASA/JPL, and University of Miami. Results and questions raised by earlier studies, including HIPPO, a pole-to-pole study of greenhouse gases, are significant motivators for the ORCAS project. Q: The Southern Ocean is unique in many ways, can you explain why it has such important implications to climate change? A: The Southern Ocean, the water below approximately 45º South that circumnavigates Antarctica, plays a critical role in setting the overturning circulation for the global oceans, and determining the partitioning of heat and dissolved gases between the atmosphere and deep ocean. The region is particularly sensitive to climate change, and evidence suggests that it is already responding to observed changes. The Southern Ocean currently absorbs a significant amount of human emitted CO2, but the future trajectory of this reservoir is highly uncertain. Sparse observations and complex interacting physical and biological processes limit our understanding of biogeochemistry and climate feedbacks at high southern latitudes. The measurements proposed under ORCAS will add new observational constraints with unprecedented spatial coverage for Southern Ocean biogeochemical variables. 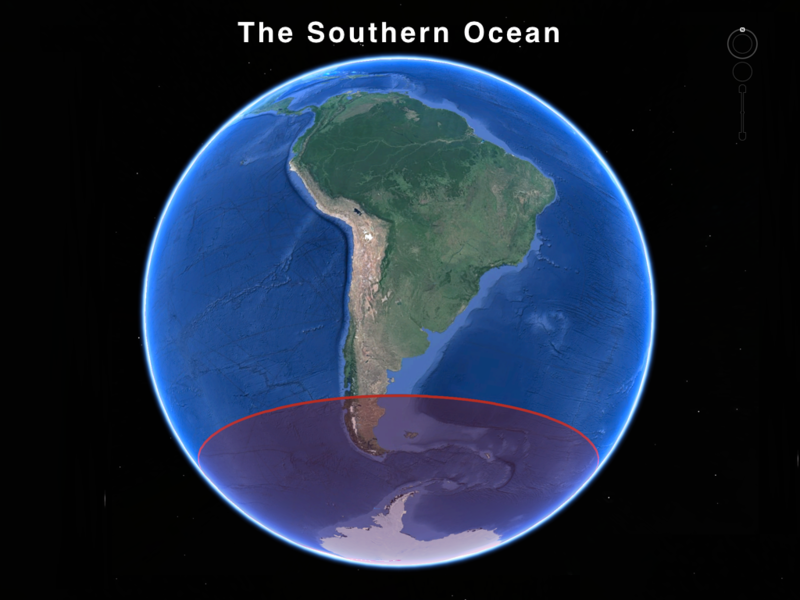 The Southern Ocean is the primary pathway for CO2 and heat to enter the deep ocean because it is one of the few locations on Earth where very cold waters from deep ocean currents are exposed to the atmosphere before the proverbial "conveyor belt" of ocean circulation brings them back down to the depths, these currents are vital in partitioning and distributing nutrients and heat throughout the entire ocean. Climate models are challenged to accurately predict the changes in uptake of CO2 and heat by the Southern Ocean. Q: How are you collecting data for this project? 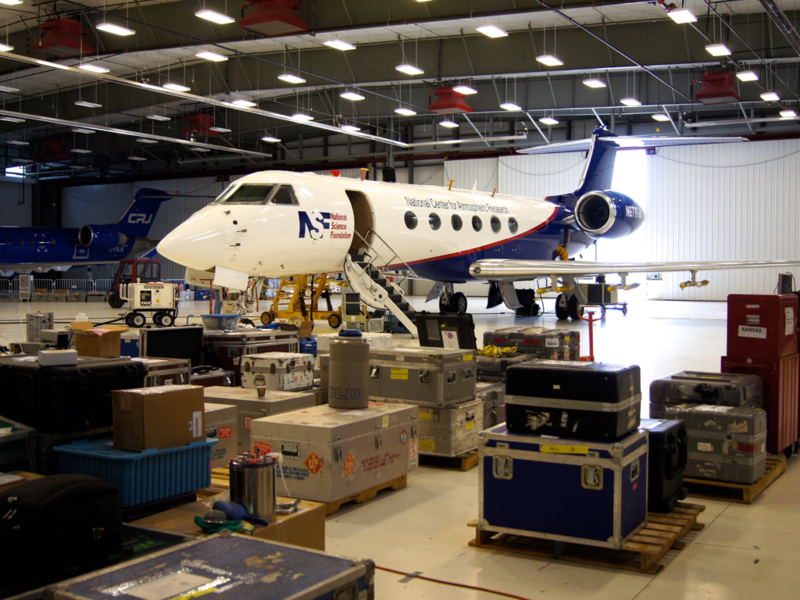 The NSF/NCAR HIAPER Gulfstream V research aircraft is a flying laboratory with a suite of instruments on board specifically suited for this research project. Instruments will make measurements of the carbon cycle, trace gases, aerosol and cloud microphysics, and ocean color through remote sensing. The aircraft will be based in Punta Arenas, Chile and make approximately fourteen 7-hour flights south and west over the productive Southern Ocean, and east of over the iron-rich Patagonian Shelf and surrounding areas. Flight patterns will include several "dips", meaning the aircraft will fly from approximately 30,000 feet to 500 feet over the span of 20 minutes allowing scientists to profile the atmosphere. Data from these maneuvers resemble a curtain, or slice of the atmosphere. HIAPER will collect the majority of the measurements for this project, however, simultaneous collaborative projects are also taking place in the study area and will contribute to the overall research efforts of the project. In addition to data collected by the NSF/NCAR HIAPER, a number of other collaborative measurements programs are either underway or planned in the ORCAS study region. The most significant of these is the Palmer Long Term Ecological Research (LTER) program, which seeks to obtain a comprehensive understanding of the marginal ice-zone ecosystem – the climate, plants, microbes, animals, biogeochemical processes, ocean, and sea ice along the western side of the Antarctic Peninsula. The LTER utilizes the Antarctic Research & Supply Vessel (ARSV) L.M. Gould to make measurements of water column profiles for hydrographic properties, dissolved inorganic carbon, phytoplankton and zooplankton stocks and rates, and biogeochemical processes. Another important sampling program is the Ocean Observatories Initiative (OOI), an NSF funded network of sensing arrays with initially four global nodes. Each node consists of a 50 km triangular network of tethered buoys and autonomous profiling gliders collecting biogeochemical measurements including pCO2 (buoy only) [p indicates partial pressure of a substance], dissolved O2, and the ability to measure specific molecules in the water. One of these global nodes is within the ORCAS study area and was recently installed. The data collected during ORCAS will be made freely available to carbon cycle researchers and the general public. By bridging traditional gaps between observationalists and modelers ORCAS will optimize the utility of the measurements and their ability to test and improve models. The ORCAS measurements will lead to the improvement of ocean biogeochemical models and associated Earth system models used to make climate projections of high societal relevance. Q: Can you explain how gas from the atmosphere, such as CO2 and O2, is absorbed by the ocean, and does temperature play a role with how much can be absorbed by a liquid? 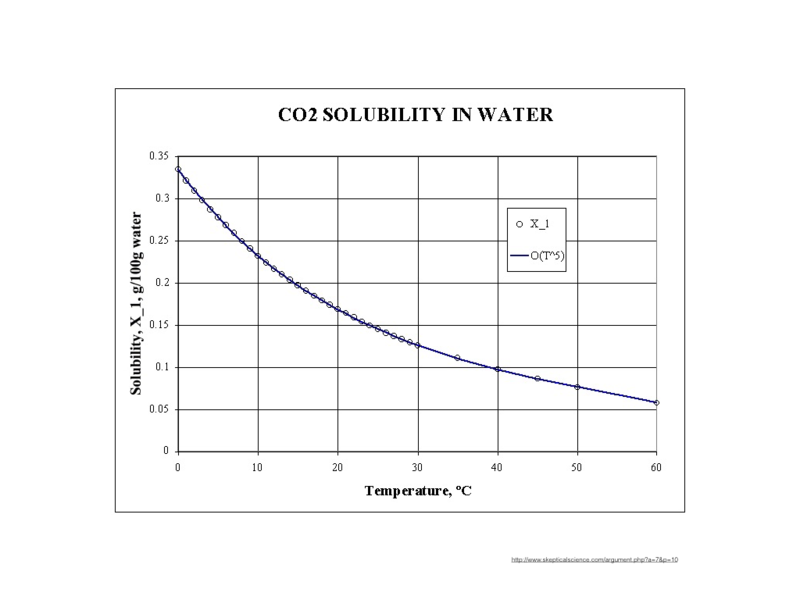 Solubility of CO2 in water. Solubility decreases as temperature increases. There is a gas law that states "At a constant temperature, the amount of a given gas that dissolves in a given type and volume of liquid is directly proportional to the partial pressure of that gas in equilibrium with that liquid." In other words, at a given temperature a gas will dissolve into a liquid to a degree that is determined by the balance between the undissolved gas and the dissolved gas in the liquid. However, another gas law needs to be considered as well. Temperature affects the amount of gas that can be dissolved in a liquid, or solubility. As temperature increases, solubility decreases and conversely, as temperature decreases solubility increases. This is one of the reasons data show seasonal fluxes of gases in the atmosphere and why increasing global temperatures may cause the ocean uptake of CO2 to slow down. There is a concern that increased anthropogenic, or human-produced, CO2 in the atmosphere could creates a positive feedback loop, a cycle in which the effects of a change in a system increase the magnitude of the change. For example, if ocean temperatures warm, CO2 will be released from solution, increasing the atmospheric concentrations leading to further heat trapping mechanisms. Q: Why is O2 important to measure? 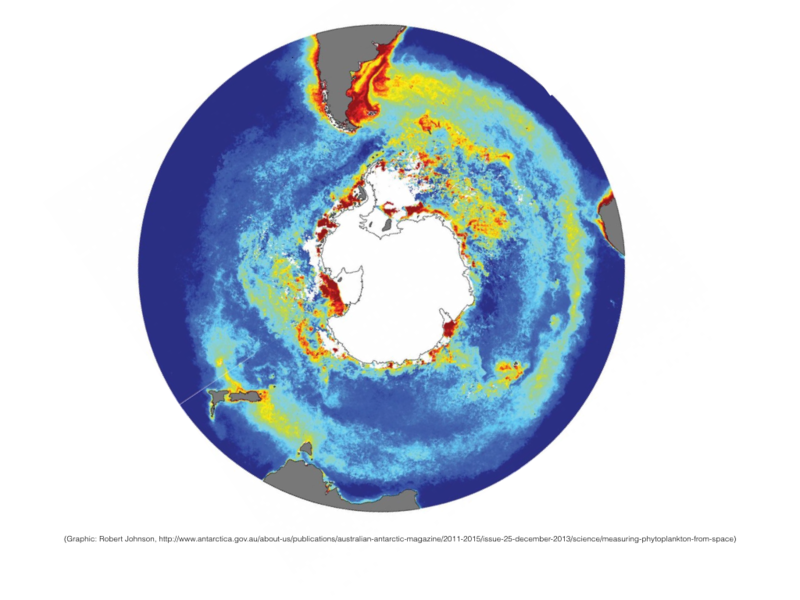 Concentrations of phytoplankton chlorophyll observed by satellites in the Southern Ocean averaged over summer from 2002 to 2012. Red and yellow indicates regions of high chlorophyll and blue indicates regions of low chlorophyll. Click to enlarge. Direct measurements of O2 in the lower part of the atmosphere paired with remotely sensed chlorophyll and plankton taxonomy will provide a basis for scaling flux estimates up to broader regions and testing model skill. O2 levels have a direct relationship with CO2 and are easier to measure, therefore measurements of O2 can provide information on the processes influencing CO2 fluxes. When O2 is released from the ocean due to seasonal warming, so is CO2, however when O2 is produced biologically from ocean algae, CO2 is absorbed. The air-sea flux of O2 has essentially no human-produced anthropogenic component. The ORCAS project will take place during the Austral, or Southern Hemisphere, summer which will have the most abundance of ocean algae available, producing high levels of O2. Collectively, the ORCAS measurements will improve understanding of the present day carbon cycle gases of Southern Ocean air-sea gas exchanges, laying the groundwork for increased physical representation of feedbacks to climate change. Q: What kind of project management and support services are needed to put on a project of this caliber? The NSF/NCAR HIAPER and some of the equipment needed during a field project. Click to enlarge. Project management and planning starts years in advance to ensure the project is successful. Adequate time and planning strategies are needed to secure flight plans, diplomatic clearances, determine a safe location for the aircraft and crew, and shipping the needed equipment to Punta Arenas, among other things. The systems administration team develops a field catalog to display and house data, as well as display the needed flight tracking tools and satellite overlays. They also ensure safety and reliability of communications and data transfer form the aircraft to servers. The aircraft and instrumentation team need several months to properly upload the aircraft with the needed electrical wiring and tubing, as well as install the suite of instruments in the required configuration. The aircraft mechanics are continually working on the aircraft to ensure safe operations. The pilots work very closely with the PIs and EOL Project Management Office to plan the 14 seven-hour flights, taking into consideration Chilean and Argentine airspace regulations and concerns. Q: What is the significance of the O2/N2 ratio? Oxygen variations are really interesting because of what they can tell us about the processes influencing CO2, but by themselves are miniscule. This is because there is so much O2 in the atmosphere to begin with (~21%). The changes in O2 are so small that they can only be interpreted as relative changes in the O2/N2 ratio. Because the amount of N2 in the atmosphere (~78%) is less variable than O2, changes in the O2/N2 ratio primarily reflect changes in atmospheric O2. Over the Southern Ocean, these changes reflect various influences from biological productivity, heating and cooling of surface waters, and deep water ventilation.